♦ 15.6 inches LCD screen( resolution 1920 × 1080), support 10 points touch control. Slim design with narrow bezel, the suitable 16:9 displayratio provides a superior users viewing experience. display ratio for better and higher-quality image display. ♦ Display user’s information synchronously, such as user’s name/position or title /organization name/Logo and etc, support font/ background/ customized template. ♦ Support independent adapter to supply power and GONSIN20000S system distributed power and intelligent grouping management. ♦ Conference terminal, power HUB and conference server are all connected by network cables. Flexible cabling reduces project workload, makes large-scale construction projects easier. ♦ It supports daisy-chain connection, star connection and mixed connection. The system is highly stable and reliable. The breakdown of one extension won’t influence the other extensions, and the malfunction of one attachment among the extensions won’t influence the system to work. ♦ The cabling of terminal is bottom mounted, which supports hidden or open installation, to make the desktop clearer and tidier. ♦ Automatic restoration function: supports hot plug. 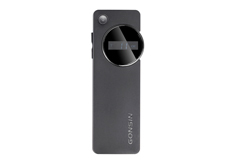 ♦ With headphone jack(Ø 3.5 mm) and adjustable volume(9 levels). ♦ Built-in MIC jack(Ø 3.5 mm) to connect with external MIC, which meets the requirements of different usage scenarios. ♦ Built-in left and right loudspeakers(2W) and adjustable volume(9 levels). Reasonable tune trope design, output clear and loud sound. Adjusting volume through screen touch is available. ♦ Attendance registration function: registration is initiated and ended by paperless terminal(chairman), the results can be displayed on LCD screen. ♦ Voting function:started and ended by paperless terminal(chairman), the results can be displayed on LCD screen. ♦ Customized voting function: The paperless terminal(chairman)can initiate and end the customized voting, voting results can be displayed on paperless terminal. The voting content is defined by GONSIN intelligent Conference management software. ♦ Call service: participants place a call via paperless terminal. The service staff will provide the service in according to the request displayed on the paperless call service terminal. Basic functions: paper,pen, tea, towel and etc, the functions can be customized. ♦ Terminal can display user’s info, conference info, conference results and on-site seating map. terminal, the user could open and browse the files; it supports DOC,DOCX,PDF,PPT,PPTX,JPG,PNG,BMP,MPS, MP4,AVI, FLV, WMV and other format files. Files can be displayed in screen sharing status. ♦ Sharing screen: when the user is browsing the files via paperless terminal, it can share the screen and other terminals could display the same content, including page scroll, paging, notes and others steps. ♦ Files note function: users can make notes on files, the notes can be saved in the server. 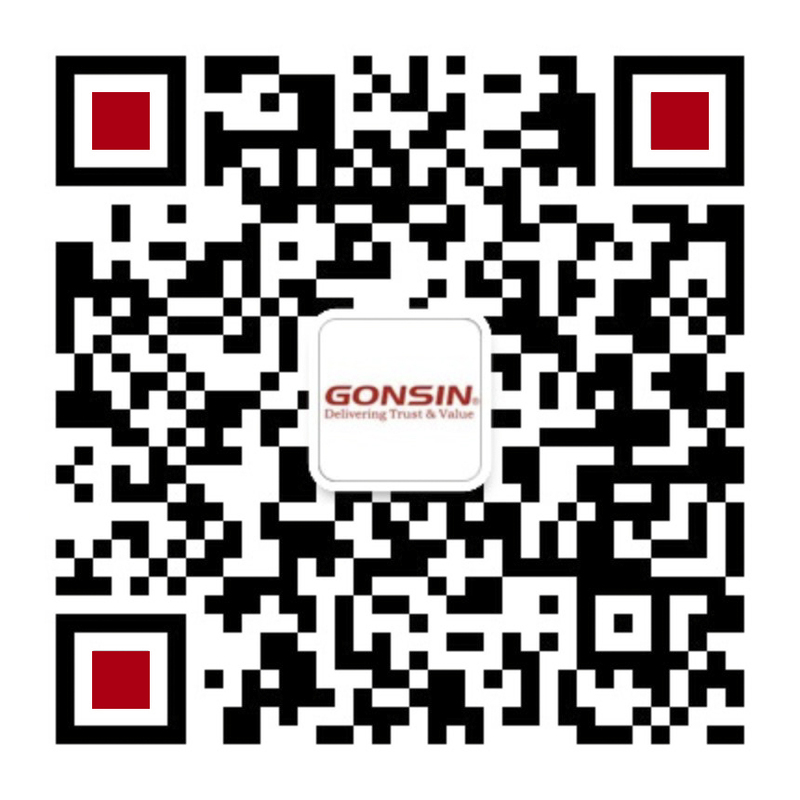 ♦ GONSIN paperless conference system has developed on Android platform, it utilizes data encryption and anti-restoration technique to ensure information security. ♦ Every serial-number is one and only one, the conference system supports automatically or manually assign ID to the corresponding equipment. ♦ Support digital whiteboard function, user can create whiteboard quickly, the content will be saved in the server. ♦ Support surfing the internet via the browser. ♦ Randomly set any one terminal as Chairman Terminal More functions of The Paperless Chairman Terminal are as below. ♦ Support send mass system messages to all paperless terminals. ♦ Allow to check conference information, such as attendance registration, ask for leaves, voting process and result, call service information, synchronous screen sharing, mic on/off situation and etc. ♦ Mic button utilizes luminous capactive touch control design, with concise appearance, convenient operation, accurate response and long service life. ♦ Supports 48KHz audio sample freq, acoustic frequency response can up to 20Hz~20KHz. ♦ Audio frequency sensitivity of each terminal (7 levels) can be adjusted separately or uniformly. 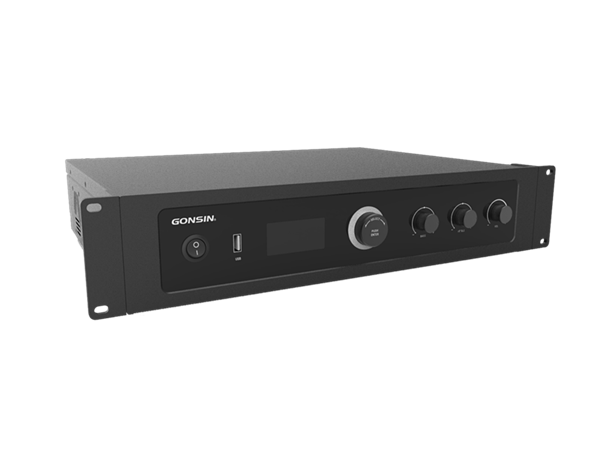 ♦ Built-in high-performanc digital audio processor (DSP), helpful to remove the useless low-frequency and avoid low-frequency acoustical shock, which better improve the sharpness of sound. ♦ Pluggable gooseneck microphone stem, convenient for equipment maintenance. ♦ System Mode: VOX, Auto, FIFO, Operator. out is adjustable ( 20-250 seconds). More functions of The Paperless Chairman Terminal are as below. ♦ acoustic frequency response can up to 20Hz 20KHz. 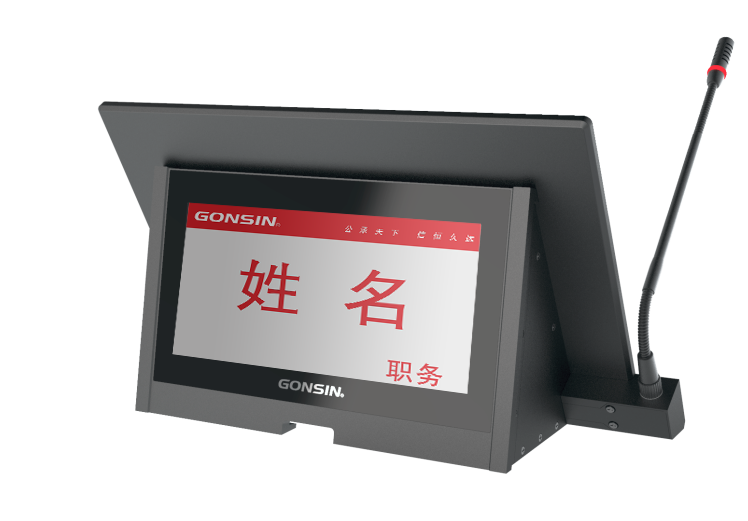 ♦ Electronic nameplate utilizes 10.1 inches super bright HD LCD screen( resolution 1280 ×800);16:10 display ratio for better and higher-quality image display. ♦ Developed based on LINUX operating system platform, with full digital audio technology, built-in high-speed CPU and high-performance DSP digital audio processor. ♦ All the equipment are connected by cable. Flexible cabling reduces project workload, makes largescale construction easier. ♦ Support conference topic management, attendance registration, voting, grading, evaluation, election function, support multi-topic voting and other customized functions. ♦ Support customized user interface’s color and size, background, style, data connection and others. ♦ Black tempered glass panel design, clear and high-grade. All the function divisions are distinct and easy to operate. ♦ AF sensitivity of each terminal (7 levels) can be adjusted separately or uniformly. ♦ Conference terminal, power HUB and conference server are all connected by cable. Flexible cabling reduces project workload, makes large-scale construction easier. ♦ The serial-number is one and only, the conference system supports automatically or manually assign ID to the corresponding equipment. ♦ Universal voltage switching power supply for wider usable range and sufficient power supply. ♦ Loud speaker: VOX, Auto, FIFO, Operator. ♦ VOX function: in VOX mode, the unit will be activated for user speaks; VOX sensitivity can be adjust by the server ( high, middle, low); microphone time-out is adjustable ( 20-250 seconds). 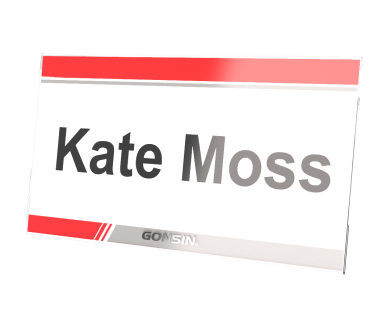 ◆ Meet the demand of an economic nameplate display. The Terminals offer paper nameplate slots in the rear panel, and Nameplate Buckle used as a combination part of the Terminal. ◆ High-quality acrylic materials, high-class design and smooth surface. Magnetic snap, easy and convenient to operate. ◆ Optional accessory, for Desktop Paperless All-in-one Terminal without electronic nameplate. ♦ Designed to meet the power requirement for larger congress system. ♦ 15.6 inches LCD screen( resolution 1920 × 1080), support 10 points touch control. Slim design with narrow bezel, the suitable 16:9 display ratio provides a superior users viewing experience. 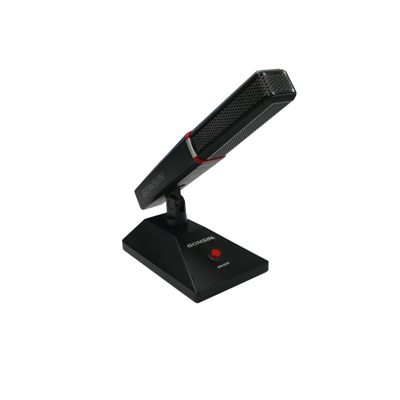 ♦ Conference terminal, power HUB and conference server are all connected by cable. Flexible cabling reduces project workload, makes large-scale construction project easier. ♦ Built-in left and right loudspeakers (2W) and adjustable volume（9 levels）. Reasonable tune trope design, output clear and loud sound. Adjusting volume through screen touch is available. 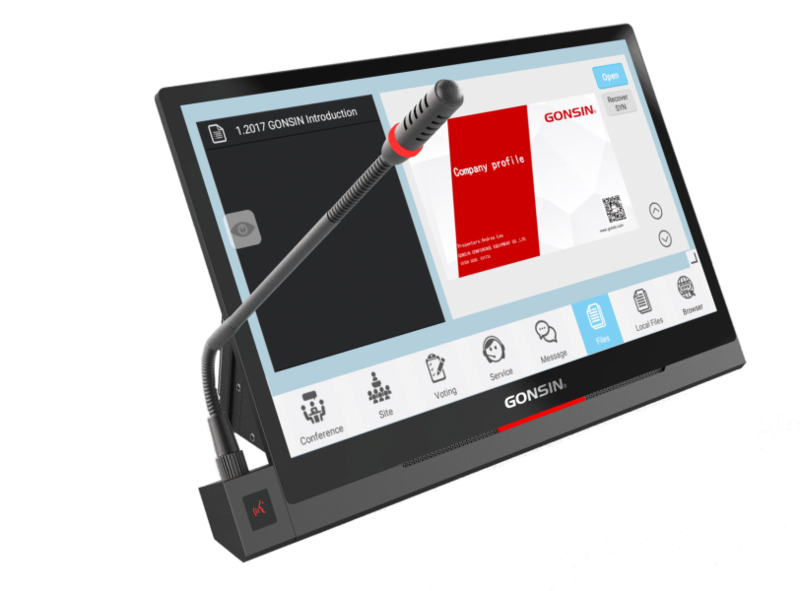 ♦ The serial-number is one and only one, the conference system supports automatically or manually assign ID to the corresponding equipment. ♦ Call service: participants place a call via paperless terminal. The service staff will provide the service in according to the request displayed on the paperless call service terminal. Basic functions: paper, pen, tea, towel and etc, the functions can be customized. ♦ In compliance with IEEE 802.11n network standard, adopt WIFI wireless communication technology. ♦ Adopt 128 bit AES encryption technology and support WEP/WPA/WPA2 wireless security technology,ensuring the privacy of meetings and avoiding eavesdrop as well as malicious interference. ♦ Support 2.4G/5.2G/5.8G triple-band wireless communication,choosing the secure wireless channel to ensure the reliability of wireless connection. 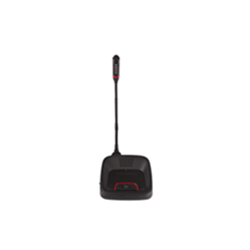 ♦ Maximally support 128 wireless APs to achieve greater wireless coverage area and terminal seamless roaming. ♦ Support SSID WiFi-settings, to ensure non-interference when operating several systems within the same environment. ♦ Support ceiling/wall-mounting/desktop installation, flexible for various conference installation environment. ♦ Wi-Fi signal coverage and stable communication distance can reach 30 meters.